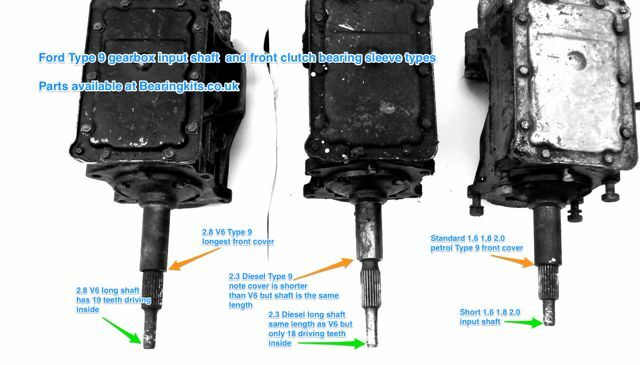 Here is a photo explaining about the differences between the input shaft lengths and front cover types fitted to the Ford T9 transmission unit. The 2.8 V6 and 2.3 Diesel have long shafts and a long pilot shaft going into the flywheel spigot bearing. The V6 has a longer front cover tube than the diesels version. All clutch splines are the same for the above. I hope this will help you identify your Type 9 5 speed gearbox if you're unsure.